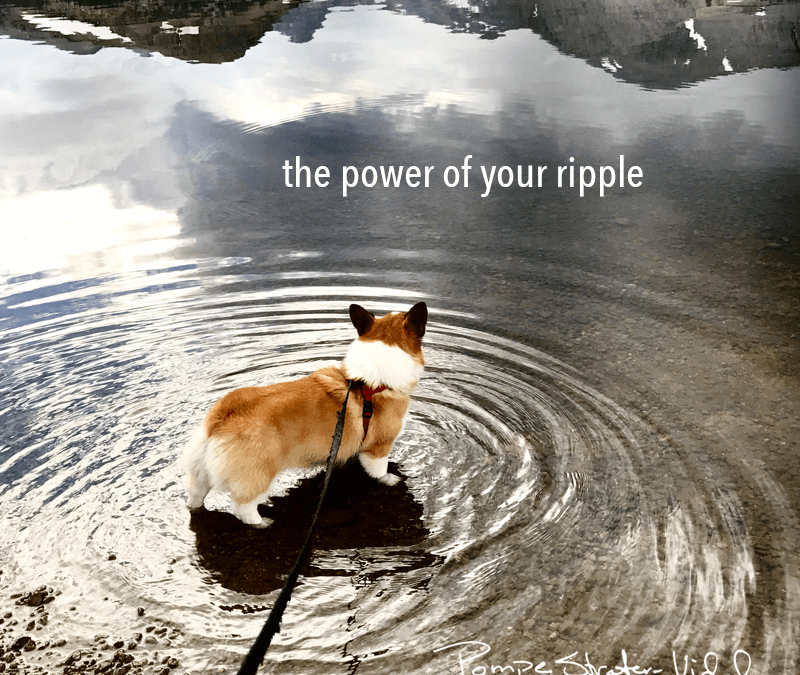 Never underestimate the power of your ripple. The energy you carry creates an impact on you, and the world around you. It’s basic physics; drop a pebble in a quiet pond and watch the ripple move across the still surface of the water. Meditation allows us to become a ripple of peace, light and love. When the world goes crazy, you can go down with the ship, or choose to meditate every day. In psychology, this means letting go of reactivity. When you’re caught in reactivity, identified with your emotional responses, your behavior is dictated by the actions of others. You give away your power! Road rage is a perfect example of reactivity run amok. So is a lot of social media. And, at the dark end, mob psychology. In spiritual traditions, this means finding forgiveness, an aspect of love. Forgiveness is about letting of the pain of the past. Notice I say letting go of the pain. You don’t have to like what they did! Without forgiveness, you’ll stay stuck in anger, resentment, and even hatred. The very things carried by the person who hurt you. Who wants that? Try this Metta Meditation to help you let go of reactivity, and open your heart to forgiveness. Metta means loving kindness, to love yourself so you can love others. Find a quiet place to sit with a straight spine. Either cross your legs to sit on a cushion, or sit in a chair, both feet flat on the ground, legs uncrossed. Take a few deep breaths now, and settle in. Root down and rise up from your belly center. Begin by seeing a person, or a pet, that you love a lot. Feel how much you care for them. Deeply. Now send them good thoughts, thoughts of love. Blessings. Traditional phrases like this: “may you be safe, may you be truly happy, may you be healthy. Or loving thoughts all your own. Now take these same phrases, either the traditional ones or your own words, and direct them to your self. Place your hand on your heart if you like. Tell your self: “may I be safe, may I be truly happy, may I be healthy. And now see your self as a shining beacon of light, sending out messages of love to everyone, everywhere, in your town, in your country, on the planet.